For more information about this event, please contact Festival du Monde Arabe de Montréal at fma@festivalarabe.com. IMPORTANT : Nada Raihane and Kamel Maati as well the Algerian musicians who were to participate in this event did not obtain their visas to Canada. Therefore, Nada Al Raihane will be remplaced by the singer Sanaa Moulali. For those who bought their tickets and would like to be reimbursed, all refunds are allowed BEFORE the show and not after via the website www.lepointdevente.com. In May 2012, the Arab world lost its “Algerian rose,” Warda Al-Jazairia, one of its great divas who, alongside Oum Kalthoum and Fairuz, have succeeded in bringing the Maghreb and the Machreq together with equal fervour, inducing the public into endless cycles of ecstasy, symbols of a sumptuous belle époque that, sadly, exists no longer. Known for her vast repertory and adulated for her powerful performances, Warda achieved resounding success in the Arab world for her illustrious love songs as well as for her patriotic songs during the Algerian war. Born in France, from a Lebanese mother and an Algerian father, Warda lived and experienced the peak of her career in Egypt, becoming a consecrated icon of Arabic song. 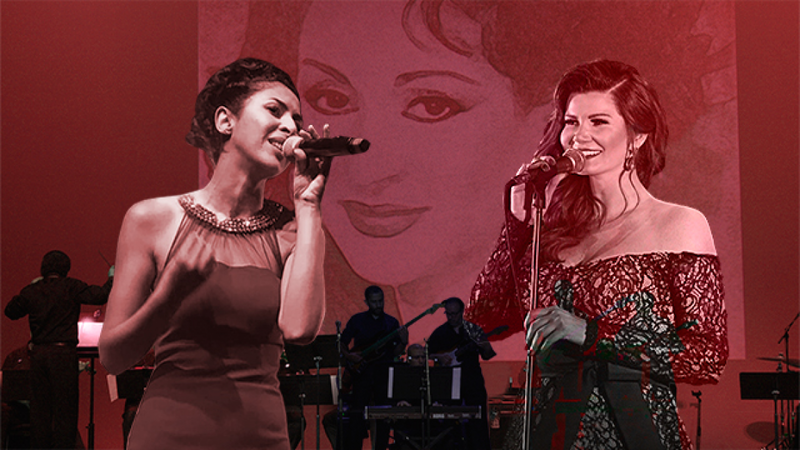 The FMA pays tribute to her through the vibrant voices of brilliant singers Ranine Chaar and Sanaa Moulali. Ranine Chaar excels both in the interpretation of classical Arabic songs and in opera through a sensational voice that navigates with disconcerting ease between jazz and tarab, sufi and pop. She has stood out in particular through her principal role in the opera Kalila wa Dimna in its world première at the Aix-en-Provence Festival. Sanaa Moulali grew up listening and to the great classics of Arabic music and has sung the repertoire of the greatest singers such as Oum Kalthoum, Mohammed Abdel Waheb, Laila Morad, Asmahane, Fairouz.... She accepts today, despite the short delay, to take up this brave challenge with grace, determination and enthusiasm. We are proud to welcome her for the first time in Montreal as part of this vibrant tribute to our Diva and are grateful for her great generosity. Borne by two stars of Arabic song, and led by Mouayad Khaldi, this concert promises you pure magical moments that will revive, in the course of an evening, the eternal melodies bequeathed to us by the great diva.